Whooping Cough (Pertussis) - body, last, causes, What Is Whooping Cough? Whooping cough, also known as pertussis, is an infection of the respiratory system caused by Bordetella pertussis bacteria. Whooping cough is an infection of the respiratory system that occurs most frequently in young children. It is caused by two related bacteria: Bordetella pertussis (bor-de-TEL-a per-TUS-is) and Bordetella parapertussis (bor-de-TEL-a para-per-TUS-is). What Happens When Children Get Whooping Cough? Whooping cough can last for as long as seven weeks. During the first or second week, children feel tired and feverish, and they develop a short, dry cough that gets worse at night. During the next few weeks, the children experience coughing spasms that last for several minutes, during which they take in loud, sudden breaths that sound like a "whoop." They also may cough up mucus * , which can cause choking and vomiting. In some cases, whooping cough may lead to ear infections and pneumonia. The coughing spells are very tiring, and they interfere with sleep. 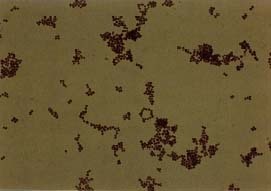 Bordetella pertussis bacteria seen under a microscope. © George J. Wilder/Visuals Unlimited. During the last few weeks, when children begin to recover, their coughing becomes less frequent and their vomiting stops. When parents or doctors hear the characteristic "whooping" sound, they often will suspect that whooping cough is the cause. The doctor sometimes will take a swab of mucus from the nose or throat to examine under the microscope for evidence of Bordetella pertussis or Bordetella parapertussis bacteria. Usually, treatment involves trying to make the child as comfortable as possible until the infection runs its course. The doctor may prescribe medication to make it easier to sleep and will usually recommend frequent light meals and snacks to replace the nutrients lost due to vomiting. Sometimes the doctor will suction the child's lungs to remove mucus and make it easier to breathe. The doctor may prescribe antibiotics to treat ear infections and pneumonia, and to prevent the disease from spreading to other members of the child's family, but the antibiotics usually cannot shorten the duration of the coughing. Whooping cough can be very dangerous for infants and young children, and the doctor may recommend that a child with whooping cough be hospitalized. How Is Whooping Cough Prevented? In the United States, infants and children receive pertussis vaccinations as part of their normal childhood shots. Children are required to be immunized against whooping cough, as well as against several other diseases, before they enter school. Vaccination with earlier ("whole cell") forms of pertussis vaccine sometimes caused side effects * in infants, with reactions that included fever, irritability, and (in rare instances) seizures. Researchers have developed a new "acellular" pertussis vaccine, which causes fewer side effects and still protects against whooping cough. * mucus (MU-kus) is a kind of body slime. It is thick and slippery, and it lines the inside of many parts of the body. * side effects are unwanted symptoms that may be caused by vaccines or medications. Pertussis vaccination during childhood does not give lifetime immunity, and adults should check with their doctors about receiving booster shots. Whooping cough can cause fever and quick short coughs due to spasms of the glottis as the air leaves the lungs.